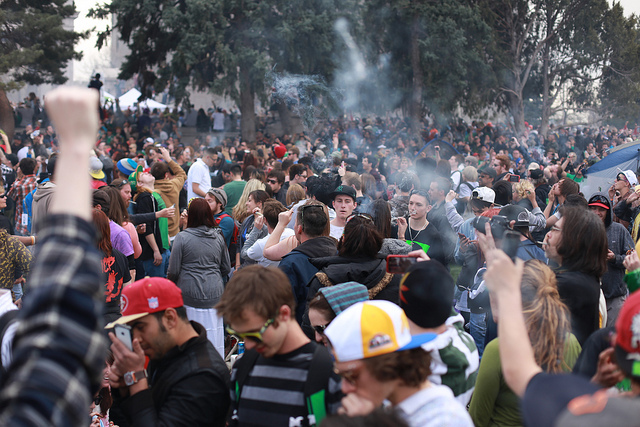 The 420 Rally in 2013 at Denver’s Civic Center Park. 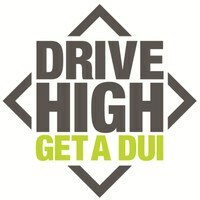 To raise awareness about driving under the influence of marijuana, the Colorado Department of Transportation is staging a “slow-speed chase” today, April 20, from 2 to 3 p.m. around Civic Center Park in Denver. The event coincides with an expected marijuana rally and the Snoop Dogg concert at Fiddler’s Green Amphitheater. April 20 is when “stoners nationwide” celebrate marijuana, Katy Canada wrote for The Denver Post. The slow-speed chase (SSC) will use two vehicles from CDOT’s “Drive High, Get a DUI” campaign, one that looks like a patrol car and the other wrapped in bright marijuana leaf graphics. Both cars, festooned with messages about the consequences of driving while high, will be driven by CDOT representatives, with invitees from the media riding along. A second SSC will be held from 3:30 to 5 p.m. before the Snoop Dogg concert at Fiddler’s Green. The chase was originally scheduled for April 16, but was postponed due to snow. “We believe the safety messaging on the vehicles would be lost in the snow,” CDOT wrote. Denver’s annual 420 Rally, also scheduled to take place on April 16, was also postponed due to the snow. Grace López Ramírez of the [Denver Parks and Recreation] Office of Special Events said officials requested that rally organizers take precautions to ensure attendees’ safety and to avoid damaging Civic Center’s grass, which is more fragile after snow has fallen. Am I missing something here? April 20th, or 4/20, isn’t until Wednesday, when the weather is predicted to be seriously better than it has been over this weekend. But, nevertheless, why have a 4/20 rally and not have it on 4/20? A driver can be prosecuted in Colorado for DUI if his or her blood is found to contain 5 nanograms of active tetrahydrocannabinol (THC), the psychoactive component of pot. Law enforcement officers are also permitted to base arrests on “observed impairment” regardless of the blood level of THC. Image by Cannabis Destiny, used under Creative Commons license.